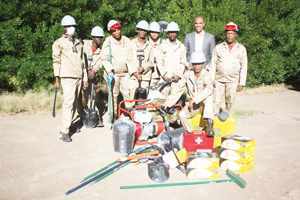 Sylvanie Beukes with the group of miners and the equipment they received from Geo-Capricon and the Social Security Commission Development Fund. A group of small scale miners based in the Hardap region received equipment and training to the value of N$100,000 from Geo-Capricon Mineral Developers. Geo-Capricon, founded by Sylvanie Beukes and Hugo De Muinda, co-financed the project with the Social Security Commission Development Fund. The equipment ranges from safety boots, gloves and goggles to a generator, drilling equipment, first aid kits, sleeping bags and other small tools. 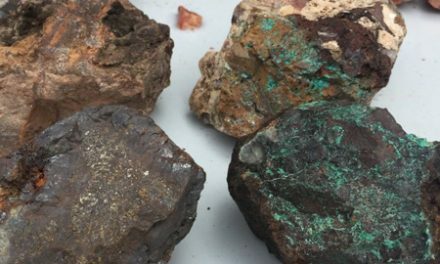 This southern small scale mining project has been run for a year by Geo-Capricon Mineral Developers to assist small scale miners in Hardap to expand their exploration activities. Social Security procured the equipment and provided the necessary training to ensure the miners’ safety while they work. It also covered areas such as mining equipment, gem stones, the environment, the mining industry and mining policy. Beukes said Geo-Capricon was founded with the core focus to lead a new resource-based economy, through evaluation, mineral resource development and the empowerment of small scale miners. Mining remains the bedrock of the economy and is growing, according to Geo-Capricon. Small mining has a role in this growth, however due to constraints caused by various factors in the operating environment, their contribution is limited. Factors such as finance for equipment, adequate skills, farmer-miner conflict, safety training and access to markets, and in addition, the onset of winter, create extreme conditions for the miners and sometimes make it impossible to carry on with their activities. The project caters currently for about 25 small scale miners from the areas of Gibeon, Rehoboth and Mariental. It intends to establish over 25 small scale mining entrepreneurs that directly influence the livelihoods of over 25 households. The Social Security Commission Development Fund’s main objectives are to conduct training and support employment schemes for the benefit of socio-economically disadvantaged persons who are unemployed. The fund also grants bursaries, loans and other forms of financial aid to students.